A bond is a fixed income investment in which an investor loans money to an entity (typically corporate or governmental), which borrows the funds for a defined period of time at a variable or fixed interest rate. In exchange, the issuer of the bond agrees to pay you a pre-set, regular interest rate payment for a fixed amount of time. At the end of the term, the issuer (who borrowed the money) agrees to pay you back the bond’s par value. While bonds are considered less risky than stocks, investing risks vary depending on the type of bond you buy. The interest rate is based on a number of factors, including the risk of the loan: The higher the risk, the higher the interest rate. All bonds carry market risk, and if you sell the bond before the end of its term, you may not recoup the principal amount you paid. In addition, it’s important to note that the issuer may default on either the interest payments or the payback amount, or both. Keep in mind that interest rate fluctuations affect bond prices. When interest rates fall, bond prices tend to rise, and when interest rates rise, bond prices tend to fall. Federal bonds are issued by the federal government, while municipal bonds are issued by state governments or local municipalities. 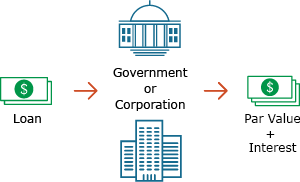 Within these 2 categories are tax-exempt and taxable bonds. Tax-exempt bonds are usually bonds issued by a municipal, county, or state government (called municipal or "muni" bonds). Bond interest payments are exempt from federal income tax and, in some cases, state and local income tax. While the interest income is tax-free, capital gains, if any, will be subject to taxes. Income for some investors may be subject to the federal Alternative Minimum Tax (AMT). Tax-exempt bonds may fit within your overall investment strategy, depending on your tax bracket and investment goals. Aside from Treasuries, which can be purchased directly from the U.S. government, most bonds must be purchased through a brokerage account or an investment vehicle such as a mutual fund. If you prefer to invest through Wells Fargo Advisors, you can invest online on your own or get help from a Financial Advisor. Investing in fixed income securities involves certain risks such as market risk if sold prior to maturity and credit risk especially of investing in high yield bonds, which have lower ratings and are subject to greater volatility. All fixed income investments may be worth less than original costs upon redemption or maturity. Asset allocation does not assure or guarantee better performance and cannot eliminate the risk of investment losses. Diversification does not guarantee profit or protect against loss in declining markets. As with any income earning investment, you should know how bonds will affect your taxes. Learn some specific tax considerations associated with investing in bonds. When money is borrowed, interest is typically calculated as a percentage of the principal, which is the amount owed to the lender. The percentage of the principal paid over time (typically a year) is called the interest rate.